Life happens in chapters, each with it's own mini story, and for Mike, a slightly different regime to maintain control over his sugar levels. I'll explain what I mean; the chapter entitled, 'I Know It's A Wreck But Let's Buy It Anyway,' is a good example. Romantic evenings in our first house were spent driving away the neighbours, as we hacked off damp plaster, tore down falling ceilings, replaced rotten floorboards and best of all, demolished the strongest, sturdiest, brick built, steel reinforced air raid shelter, you're ever likely to find. We were young (naive), adventurous (foolhardy), and very cold unless we were bashing something for the first three years. Mike ate a lot of chocolate, so did I for that matter. The surveyor had pointed out when we bought the house that the best thing about it was the air raid shelter, but sadly it completely filled our tiny garden and had to go. Just because a Victorian house has been standing for over a hundred years does not guarantee that it will continue to do so for another ten, ours was crumbling, but we loved it. A trusty Collin's DIY manual is an underrated wedding present, and by the time we decided that, even without the air raid shelter, the garden just wasn't big enough, the house was good to stand for another hundred years. The point of this tale is that this is where the hammer comes in. It is hard to spot a hypo when you are wearing protective goggles, covered in plaster dust and hundred year old grime, and busy. Often the first sign would be shouting, DIY can be extremely frustrating, but if this is followed by a flying screwdriver or an extra dent in the floor from a hefty thwack with a lump hammer, it's probably a good idea to stop and test. Of course, at this point, the damage is already done, and an extra repair can be added to the bottom of the ever growing job sheet, which is why, early on in this chapter, I learnt to respond to shouting by confiscating the hammer and any other tools within easy reach. Having said that, Mikes control was pretty good throughout those years. It's the intangible factors that throw us, like stress, which together with lack of sleep, did make 'The Baby Years', an effective training period in multi-tasking! You don't get training when you become the partner of a diabetic, you just get on with it. Parents of children with diabetes seem to have support available, but not us W.A.G.s. (Mike says I would need different shoes for that title.) Echoing the kids, I have never had a husband who wasn't diabetic, this is how it is, part of married life. Cooking for a diabetic, I never found a problem, low fat, high fibre, no sugar, simple rules, in fact the only inconvenience is having to take the kitchen scales on holiday. Dealing with the hypo's, that's the tricky bit. I think I have it relatively easy, Mike is a relaxed, gentle soul and even with extremely low blood sugar, does not become aggressive; stubborn, but not aggressive. You look pale - I'll test - low. Hungry - test - low. Sweating, eyes glazed over - low. Slight paranoia, things just don't seem to be going right, that can be quite hard to identify, but mostly there are obvious, early signs, and if Mike doesn't spot it, I will. Falling asleep sitting up is a good one, talking utter nonsense is entertaining and easy to spot provided you're actually listening! Personality changes are sometimes tricky to spot, but if I suggest to Mike to test his glucose levels, he generally will, and then sorts it out himself. It only becomes an emotional roller coaster when Mike's levels drop very quickly or for some reason we just haven't spotted it. Then the fight starts. With us, the battle is psychological, a battle of words, Mike's main word being "No." I have to be patient and persuasive, and I remember how hard that was in the early years, patient and persuasive is a lot to ask when the third 'P', Panic, sets in. There was some shouting, a lot of frustration, a fair bit of begging; none of which Mike could remember anything about afterwards. The experience seemed to be mine and mine alone. I am incredibly grateful to my wonderfully supportive friends and my supremely caring, loving sister, who have always been there for me to talk to and for us as a family to lean on, and on occasion, to distract the children while I force feed their father. It has become easier with experience, and we will deal with the changes that come with age as they happen, together. I was reading up a little about dafne (Dose Adjustment for Normal Eating) yesterday, including an account of one person's experience of the introductory course which gave a pretty good overview of the approach. It surprised me in two ways. Firstly it made me feel pretty fortunate to have had the care teams I did when I was first diagnosed and in the early years. It was more than 20 years ago and at that time 'exchanges' were the thing (an exchange was a unit of 10g of carbohydrate - if you've come across dafne this will already be sounding pretty familiar). To keep things relatively simple to start with, the advice was to keep a standard set of doses each day, keep your mealtimes regular and of a measured amount of carbs. I never got on very well with premixed insulin as the requirement to have meals and snacks at precisely predetermined times each single day does not fit with any kind of life I know. When I moved back to Bristol they quickly suggested I went on to basal-bolus 4 injection a day pen system. Much more flexible, they said. You could eat at different times if you needed to, or even miss a meal entirely in exceptional circumstances - suddenly getting caught in a motorway traffic jam was not a life or death crisis. If you wanted to eat slightly more, or less carbohydrate at a meal you could adjust the short-acting insulin dose accordingly. You were being your own pancreas. I suddenly felt much more in control of diabetes. At this stage the team were also telling me that people didn't really 'do' exchanges any more. People weren't being taught to be able to guess how many grams of carbohydrate are in that jacket spud. That some vague sense of relative proportions of food groups on the plate were the New Way. I remember thinking at the time that this made no sense at all. How hugely varied two rougly equal looking plates can be. How glad I was that I had been taught how to guestimate carbs from the beginning. And that's the thing I think that really surprised me yesterday. Reading the account of the introductory course made me realise that I've been doing a sort of 'diy dafne' for years, long before it was developed as a course and hailed as the Next Big Thing. It appears, however, this is not a universal experience. The whole concept of basal-bolus was introduced to me in a dafne-type way. Why wouldn't it be? How else does it make any sense? I'd be interested to hear if anyone has been put on a basal-bolus system and not had that kind of introduction - matching the amount of carbohydrate you eat with your short-acting insulin doses, keeping a close eye on your blood glucose results, correction doses when you underestimate; something sugary when you overdo it. And if not... then just how they were advised to make it work. All units of insulin are equal, you would think. But it seems some are more equal than others. A week or so ago I had a very odd hypo. In fact it was that experience and some of the conversations we had about it afterwards that were the catalyst for us as a family to begin this blog. 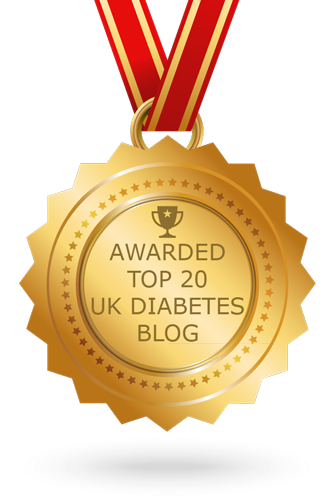 A place where we could write about our own experience of living with diabetes. Look at it from different angles, poke it with a stick, turn it over and over. The very act of writing these things down means you have to think about them quite carefully. To consider how you feel. To wonder what they mean. This in itself probably makes the writing worthwhile. Not in some maudlin, self-pitying, navel gazing way, but because when you've lived with a condition for a decade or two there is a tendency to begin to ignore it. To stop really thinking about it in any front-of-mind way. It's just there, the elephant in the room, squashing furniture, generally making a mess and getting in the way but largely ignored. So even if you weren't reading this, it would still have been worth my writing it. Well not this bit actually, this is just the preamble. But the next bit definitely. In fact probably best if you just skip forward to the next paragraph and save us both some time. Here is an amazing thought though. A week or so ago I had an odd experience with a condition that I've been living with for about 20 years. And now, just a few days later you can read about that even if you live on the other side of the world. And if you have shared an experience that you read here, you can make a comment and you and I will know that someone else has been there. That it's not just us. When the dust had settled on the hypo of the weekend before last we wondered why some of the symptoms of low blood sugar had extended for hours after normal and even quite high blood sugars had been restored. Why it had taken almost until the evening for me to fully 'get my words back'. It didn't help that when asked whether he thought this might ever happen again the doctor gave a pretty unequivocal, "Yes". It seems possible (though we are only guessing really) that a slight miscalculation of the size of jacket potato the night before might have led to a quite extended period of hypoglycaemia overnight. I woke with a start from a dream at one point which might have been my body trying to kick me back into consciousness to get something sugary, though my hypo-addled brain made up a convincing story about Derren Brown, subliminal mind control, advertising, Apple products and Twitter(!) and I just turned over. Maybe the length of period I spent with low blood sugars meant that part of my brain got stuck in hypo mode? Overnight hypos are never a good thing. I'm lucky in that they are a far rarer thing for me now than they have been in the past, and they were never more than a few times a year even then. Nevertheless we have been left with a desire to try to tighten control again. If I am honest my focus has always been on keeping my sugar levels down rather than avoiding an occasional low blood sugar. Avoiding long-term complications and accepting hypos as a price to be paid for aiming at the tiny target range. Now I felt like I was being pulled in the opposite direction. Wanting to avoid having a hypo like that ever again. I've been on Lantus glargine, a peakless basal insulin for a few years now. Peakless has always made a lot of sense to me in the context of a basal-bolus system and I certainly believe that it has helped cut out some night time hypos associated with a long-acting insulin which has a peak of activity. Of course peakless doesn't really mean peakless, it's just that the peak of activity for glargines is much less marked and the activity profile is far more level than other long-acting insulins. The shift to glargine involved the inevitable period of experimentation in terms of getting the new levels right. After the switch I found I was usually high first thing in the morning. I increased my night time dose from 10 units in increments of two in an attempt to get things back in line again. Initially I settled on 16 units, but all that extra insulin sloshing around made hypos during the day more common and after some more weeks (and quite a bit of chocolate) I settled on 14 units of glargine. Any diabetics reading will not be surprised to know that it wasn't quite as simple as that though... in that classic altering-your-doses-Kerplunk way, there was another unexpected consequence. Since beginning on a basal-bolus pen-injection system I had always taken my short acting injections before eating. Since I began using NovoRapid this has been immediately as I started eating. Now I was finding that if I injected before eating (especially if my levels were in the 4-6 target range) I would end up going low just after the end of the meal. It was almost as if the short-acting insulin, on top of the glargine was pushing sugars out of my bloodstream so rapidly that my digestive system couldn't keep up. The obvious answer was to give my digestive sytem a bit of a head start and wait till after the meal to inject. Obvious, yes; but after fifteen years of injecting before a meal I can't tell you how hard it was to try to remember the injection once it was all over and time for the washing up. I forgot to inject ridiculouosly often. Several times I even double-dosed forgetting that I had remembered. Not good. After perhaps a year I spoke to my doctor about the difficulty and wondered whether there might be a different, slightly less aggressive short acting insulin I could switch to. Her advice was that it was more likely to be the higher level of background insulin and that I would be better reducing my night-time dose of Lantus. I tried it for a day or so, but immediately my morning sugar levels rose up and I went back to 14 units. Better the devil I knew. So here I was again looking at my doses and thinking, maybe the 14 units of glargine was the reason for the hypo from hell. Maybe I did need to reduce that dose after all. It was time to give it a bit more of a thorough test. I tried it all last week. It was very interesting, and really quite confusing. Two units of Lantus glargine make an impossibly big difference. Over the last year or two it has not been uncommon for me to wake up with slightly low blood sugar. Something in the 3.5-3.9 range. Once or twice a week sometimes. A little fun-size bar with my morning coffee and I'm quickly back to normal. A few times a year I've woken up a little lower still and my brain function has started to fall to pieces. Repetitive action, confusion, talking nonsense and general family hilarity all round. So from that, I reduce my glargine night-time dose by 2 units and wake every morning with sugar levels pushing into the teens. Of all my meals, breakfast must be my most consistent in terms of matching units of short-acting insulin with carbohydrate. More often than not it's a bowl of high fibre cereal weighed on a set of scales, with skimmed milk and low fat natural yoghurt. Dietetically I'm on my best behaviour. But suddenly the usual rules did not apply. I would over-jab and under-eat and two hours later rather than finding my earlier high sugar levels corrected things would be just as bad or even slightly worse. I would find myself adding an extra four units of NovoRapid to bring my sugar levels down in between breakfast and lunch. Four units. Four. Again after lunch some perfectly guessable bread/sandwich/piece of fruit carbs when matched with their usual dose of NovoRapid would result in significantly higher blood sugars than I would expect. Another four extra units of NovoRapid to try to keep things under control. Well at least you managed to stave off the hypos though you say. Nope. Not a bit of it. Possibly partly because I was struggling to stem the ever-rising tide of blood sugars with usual meal/dose calculations no longer seeming to apply. Extra correction doses seemed to work OK as long as I was sat at my desk, but any kind of physical activity - even just a short walk to get some milk - was enough to drop me into needing something sugary. Thank goodness I didn't go to the gym that week. I don't know whether this extremely fine balance between short and long-acting doses is familiar to anyone else but I find it very odd indeed. I can't explain how the reduction of just two units on one type of insulin can have such a huge effect on requirements for other dose-and-meal combinations, adding in an extra 8-12 units over the course of a day. Previously I had only experimented it for a day or so before reverting to what I knew, but to see the same things happening over the course of a whole week convinced me that it was not just a matter of miscalculation or bad guesswork. The whole balance of how many units to how much carbohydrate with how much activity had completely shifted. 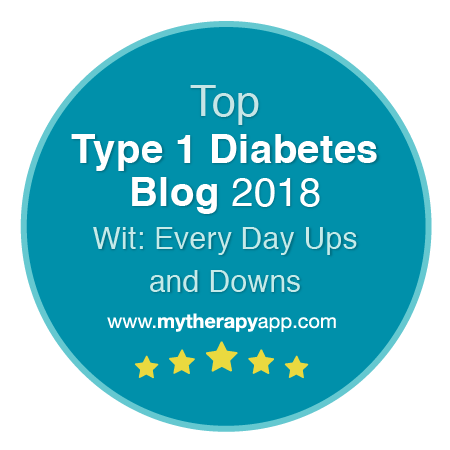 I may have had a few fewer hypos, but my overall control was so much worse that I felt I couldn't continue. So for now I'm back to square one. The usual rules are applying again, and I'm just testing a whole lot more often. I might go back to having supper again. A piece of fruit just before bed that used to stave off the overnight peak activity of Insulatard in the years before the switch to glargine and the whole what-to-do-about-waking-up-high conundrum. Your guess is very nearly as good as mine. How do you deal with diabetes? 3) Or use it to your own advantage. What do you do? I think I do… probably 1 and 3. I can’t exactly ignore my own Dad can I?! 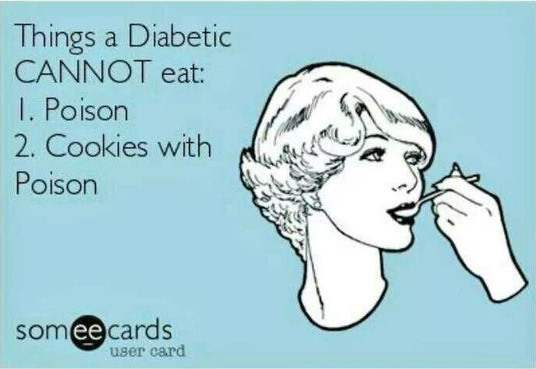 When I was little I used to think all men were diabetic because I’d never known anything else. It’s hard to imagine it if Dad wasn’t diabetic, though I expect it’s just as hard for you to imagine it if yours was. Sometimes when Dad gets up in the morning and he’s low it’s quite scary, but other times it’s just plain funny! Like when have to hug him so hard he stays on his chair instead of getting up to make the coffee Mum’s just made, or when he shuts his mouth tight and refuses to let Mum feed him chocolate like a 5 year old in a strop. I hope when you read this you’ll realise that you are not the only one in the world who knows someone with diabetes (I know two!) And that you know someone will listen to you. We love our food, Mike and I. Meals have always played a big part in our relationship. When we first met, I saw Mike's diabetes as a challenge, and there's nothing I like better than a good challenge. I would send Mike invitations from mystery women, Conchita for instance, who was going to provide for him a Mexican feast! I altered recipes, calculated carbs and created a variety of menus from around the world, each with low fat, high fibre ingredients and exactly the right amount of carbohydrate for Mike to inject his regular dose of insulin and stay on an even keel. I would dress up and speak in an appropriately silly accent for at least the first half hour of the meal. When I think back, it's a wonder he didn't run away screaming, but he didn't, and that I suppose is the secret of our success. It's all a bit of a laugh, and we do laugh. A lot. Those early meals provided invaluable training. I learnt a lot, very quickly, and it really helped that Mike loved to cook and was good at it. We cooked together as a team. We've always been a pretty good team. These days I do all the cooking, as is often the way when you have a family. We have divided a lot of jobs, as a necessity. I'm less strict with ingredients and measuring and I can see I'm going to have to really tighten up. My priorities have changed, and the importance of having family meals we all enjoy, even the fussy eaters among us, has overshadowed Mike's needs over the past few years. It's challenge time again and thankfully I'm still up for a good challenge. I reckon with a bit of careful planning and a lot of cooperation (kids!) I can probably please everyone. When I was little I didn’t really understand what diabetes was. In my opinion it was just a thing that all dads had. I had never had a dad without diabetes and I still can’t imagine what it would be like if dad didn’t have it. Sometimes it is funny when he goes low because he doesn’t seem to be aware of anything around him and always insists that he is not low. If he tells you that he is not low, that often means that he is. It is kind of scary because I don’t know if I would recognise the fact that he was low if I was at home with him alone, because it has never happened. If I did recognise that he was low, I don’t know if I would know what to do. It probably will happen at some point and I feel like I need to know more about diabetes to be able to deal with it if anything like that happened. It isn't unusual for Mike to need some sugar first thing in the morning, and it isn't unusual for me to take a few minutes to realise, you see, Mike isn't the sharpest tack in the packet first thing. We do wonder whether this is why he is low more often than he'd like in the mornings. Apparently glucose levels rise as you wake up, Mike is much less likely to have low blood sugar when he wakes up naturally, but unfortunately won't wake up until 9.30 or 10.00 unless I wake him, so at least 6 out of 7 days, he is woken up earlier than his body would like. Anyway, where was I, oh yes, not the sharpest tack. We get little more than "Ug." out of Mike before 10am. Unless he's very low, Mike, of course, deals with his sugar levels himself. To put it into perspective, I only need to intervene maybe 4 or 5 times a year, and on those occasions, usually gentle encouragement to eat or drink enough sugar is all that is needed. Once every 3 or 4 years, there's a slightly scarier moment. On this occasion, Mike seemed lucid enough to sort himself out, but had a sharp pain in his head and felt nauseous, which made it hard to swallow anything. He couldn't eat breakfast; unheard of. As he's already mentioned, the weirdest thing was his speech. He lost words. Blood sugar up, but head still hurting he went back to bed. Two hours later, blood sugar fine, he still had not found those words. I thought - minor stroke. As I drove Mike to casualty, I checked our bank balance in my head. I worked out that although we're self employed, we'd be fine to last at least six months if it took that long to recover. I thought, if it is a stroke, I'm sitting next to a time bomb. I thought, how on earth will I tell his Mum. I thought, thank God the kids are away. I thought, Mike don't leave me yet. The Doctor was able to reassure us that it wasn't a stroke, but he wasn't able to explain why it had happened or tell us how to prevent it happening again. We have never sought support with dealing with Mike's diabetes, and the realisation that after 20 years of diabetes, after 15 years of marriage, we knew more about it than the Doctor, made us feel quite alone. Well, we're not alone. Thousands of people are in our position, so the best thing to do is speak to them. I'd like to share some of the hilarious and stressful complications that occur when combining toddlers, no sleep, a diabetic husband and an Asda trolley, for the benefit of anyone about to embark on the adventure of parenthood. Our daughters, now 12 and 10, would like to join in and share their thoughts on 'life when Daddy goes a little doolally'. I can feel a list of wifely do's and don'ts coming on, like 'when you can see he's low, confiscate the hammer'. Maybe that needs a little more explaining. Watch this space. This weekend was decidedly odd. The girls were away doing exciting outward bound things and Jane and I had planned a nice weekend's worth of activity - a trip to the cinema, a meal out, that sort of thing. It was going to be great. On Saturday I ended up in hospital. It wasn't anything hugely dramatic in the end, but it was pretty scary at the time. I'm no beginner to this Diabetes lark, and I seem to pretty much know what's coming my way most of the time. I'm lucky in that I guess. I'd woken up with slightly low blood sugar on Saturday morning. This sort of blip is usually quickly sorted out with some fast acting carbohydrate (yes I know it's supposed to be Lucozade or glucose tablets but give me a fun-size chocolate bar any time). 10-20g of sugars, leave it a few minutes and all is usually well. But here was the thing... my sugar levels came up fine, but I lost the power of speech. I could write words down - though my thoughts were not particularly clear - but forming a spoken sentence was all but impossible. I have noticed some hypoglycaemic episodes having an effect on the speech centres on the brain. In fact, ask Jane or the girls and they'll tell you just how much nonsense I'll spout at the time, but this was different. For hours afterwards my sugar levels were well up (around 10-15mmol/l) and my brain was still on the fritz. A little after lunch we headed to the hospital. At that stage we had no idea whether this connected with the hypo, or something else entirely. Thankfully the staff at the hospital in Bristol were excellent. Listened carefully and checked me over to make sure I was fine to go home. But the experience has left us with a desire to note things down, ask questions, consider, and look at the condition that is part of my and my families life. It's only just striking me as I write this first post that this year I turn 41. I was diagnosed at 21 during the final year of my degree course. From this point on I will have had type 1 Diabetes for longer than I was without it. This is a good time, I think, to have a good long look at things.